A Critical Cinema 4 includes the most extensive interview with the late Stan Brakhage yet published; a conversation with P. Adams Sitney about his arrival on the New York independent film scene; a detailed discussion with Peter Kubelka about the experience of making Our African Journey; a conversation with Jill Godmilow and Harun Farocki on modern political documentary; Jim McBride's first extended published conversation in thirty years; a discussion with Abigail Child about her evolution from television documentarian to master editor; and the first extended interview with Chuck Workman. 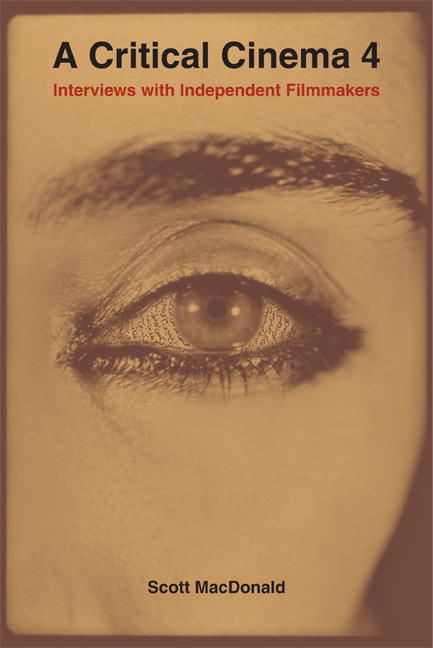 This volume also contains discussions with Chantal Akerman about her place trilogy; Lawrence Brose on his examination of Oscar Wilde's career; Hungarian Peter Forgács about his transformation of European home movies into video operas; Iranian-born Shirin Neshat on working between two cultures; and Ellen Spiro about exploring America with her video camera and her dog. Each interview is supplemented by an introductory overview of the filmmaker's contributions. A detailed filmography and a selected bibliography complete the volume. Scott MacDonald is the author of the three previous volumes of A Critical Cinema and The Garden in the Machine: A Field Guide to Independent Films about Place (2001), all from California.